Elly Dijkshoorn traveled the wall. Call for a private viewing or join the Launch of her findings on May 5th at 16:00 or a Tour on May 23rd at 19:30 or July 1st at 15:00. For Elly Dijkshoorn Vanwege, literally because of, is a search for the weight of individual parts and the way they come together in her art. 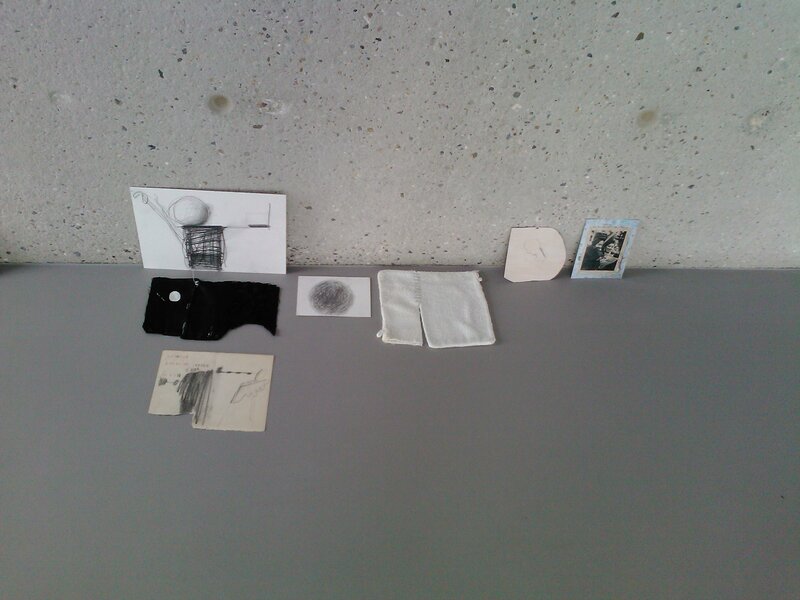 The many different works, in different techniques and stages of becoming, form one image with the wall until two cloths are caught in their own white box, hung from a graywashed cubicle. As she feels her way over the surface the many shades and characteristics of concrete and her art become visible. Like in a tale with many storylines her multilayered work unfolds. In her unlimited sensitive approach she generously shares with us her inspirations and quest for colour. Sometimes severe and sometimes witty she fearlessly finds her way through history and matter into a sensitive state of being. The work of Elly Dijkshoorn shouts love for life while at the same time it quietly makes us aware of our fragile balance with the ‘condition humaine’. This entry was posted on 04/05/2012 at 20:23 and is filed under information, programme. You can follow any responses to this entry through the RSS 2.0 feed. You can leave a response, or trackback from your own site.